When I was a girl I lived out in the country on a fruit farm in the San Joaquin Valley of California. Our garage was connected to our house by a covered breeze-way. One night my mom asked me to go out to the “outside fridge” in the garage and bring in a carton of milk. It was late at night. The garage was dark. As I opened the door into the garage, something told me to “turn on the light.” I still remember questioning the impression. There was nothing to be afraid of. The old fridge was just 8-10 feet around the front of the car. I’d passed there dozens of times in the dark. When you opened the fridge door, the light came on and you could see just fine. And yet, as I passed by the light switch, the impression to turn it on moved me to do so. I took a few steps towards the fridge, and then stopped dead in my tracks. Hanging suspended, on a single fine web, inches from my face, was a deadly Black Widow spider. I shuddered, backed up, and retreated to safety. I’d never seen a Black Widow suspended like that. They usually lurk in dark corners. I learned something that summer evening. I learned that though there is a God in the Universe who has galaxies at His fingertips, who commands worlds without ends, who watches the workings of this earth and the movements of kings and nations, He was aware of a young girl in the dark, in a garage, on a farm in the middle of California. He knew exactly where I was and He knew exactly what was in front of my face. I learned that He cared enough to move me to turn on the light. Since that evening, there have been many times in my life when I have been impressed to move into the light. To move away from darkness. I am learning to listen to the promptings of His Spirit. I know that our Heavenly Father knows exactly where we each stand. He knows exactly what is in front of our faces. And He knows how to guide us safely past whatever danger is before us. And He will do that if we will listen. I might add here that my Grandpa Rudolf almost died from Black Widow bites. One day he was out working in the field and he took his shirt off and hung it on a fence post. A Black Widow crawled into it and when he put the shirt back on, he was bitten twice on his back. He was very very sick for about 2 weeks, but he slowly recovered. Black Widows were always a fright on the farm, and there were plenty of them. My father would kill them by popping them between his fingers. I never got that close. I never got that close until I had a pet Black Widow. Her name was Sophie. She lived in a Mason jar in my kitchen window. When the kids were younger we had bug collections and I was known as the “Bug Lady” of the neighborhood. We had a pet Praying Mantis every year (always named Armstrong). We fed Armstrong bees and flies and anything we caught in the garden. Then one day, I found a beautiful Black Widow spider in the yard. I decided it would be good to teach the kids about spiders, so I captured her in a jar and added a few twigs and brought her into the house. Every day we fed Sophie flies and bees and then watched as she’d creep up on her prey, bite and then retreat and hover as the poison took effect. After the insect was paralyzed, Sophie would move in for the kill, biting again and then with swift nimble motions, she’d use all of her legs to turn the delicious morsel as she spun her web around and around and around, twirling the captive until it was entirely bound in web like a mummy. Then she’d leave the mummy hanging in the web for some time as the poison worked to break down the insides of the fly or bee. When dinner was ready, she’d return to drink the insides out, until all that was left was a shell of an insect hanging suspended in the web. 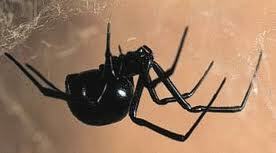 Black Widows are beautiful spiders. They are graceful and elegant. I could watch Sophie for hours. I taught all the neighborhood children about Sophie and let them feed her and then watch as she went in for the kill. I loved watching her move around her little habitat. During the winter months, Sophie would hibernate. About the time the last bees flew, she stopped eating and would be quiet and still all winter. I’d spray some water mist into the jar every now and again to keep her hydrated. Sophie lived with us for about 2 years. I could tell she was getting old, like Charlotte in Charlotte’s Web. She wasn’t as quick and she didn’t eat as much. One day she died. I was sad. She had been a fascinating pet. I found a new Black Widow not long after, and again, we named her Sophie, after the first. She also lived with us until she died. 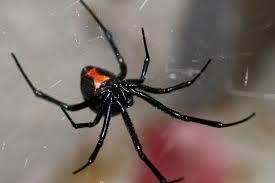 I think we had a Black Widow in our kitchen window for at least 3 years, an interesting and fascinating pet. She didn’t make noise or smell or demand much of us. Just a fly or bee every day or two during the summer months. 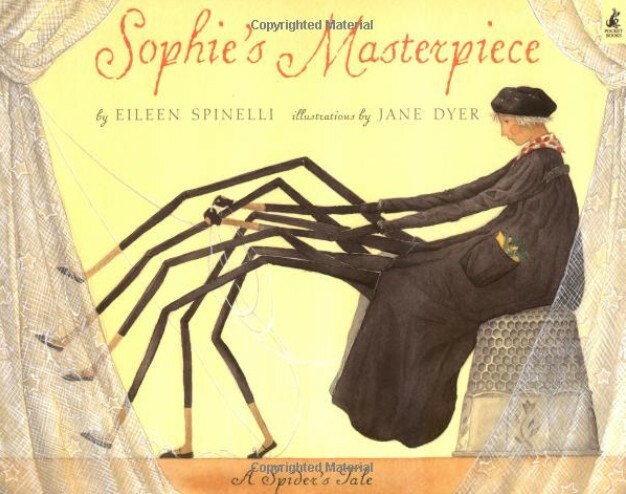 Our Sophie Spiders were dear to us, in their own way. Below is the book that inspired the name “Sophie.” It’s a wonderful children’s book, one of my very favorites. This Sophie is an artist who spins masterful pieces of art and learns to love and be loved in return. I adore the book. And now, from a distance, I also adore Black Widow spiders! This entry was posted in Family History, Lewis Family, Thoughts and Insights. Bookmark the permalink.